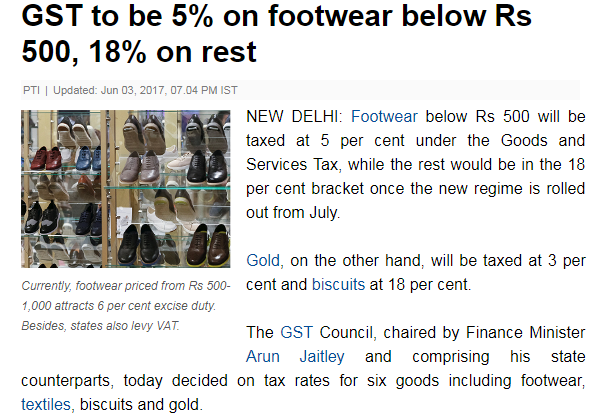 Lots of stupidity in this GST... shirts below 1000, one rate... above 1000 another rate. And shoes below 500 one rate, above 500 another rate. So retailers are selling shoes in 2 parts... one left one right. Rubber at one rate, chappals at another rate. What if you make a rubber chappal? And did you know that footwear without a backstrap is a sandal and not a chappal? Sad that our high courts had to say this. And is Kitkat a biscuit or a chocolate? The govt has ruled kitkat is a biscuit thanks to industry pressures but when I visit any departmental store, Kitkat is always stacked along with chocalates and not with biscuits. When will our babus ever grow up? Never... there is no need... it does not make sense... the more power you have, the better one feels. Today, this corrupted version of GST has opened a minefield and there are only 2 classes of people laughing all the way to the bank... the babus and the CAs. Solution: have a single GST rate. But the babudom and the political class will protest. Anything which erodes your power is never welcome. Politics and economics never go hand in hand... be very clear about this.